Our Indiana notary stamp uses the approved layout for the State of Indiana. 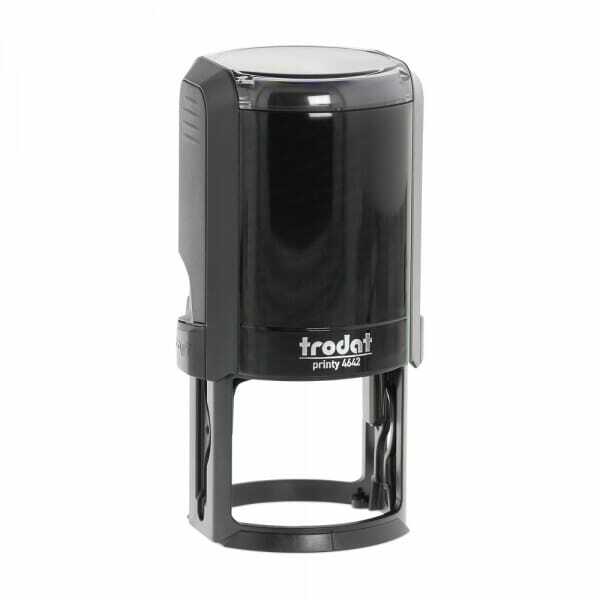 The Trodat Printy 4642 self-inking stamp has a circular impression with a maximum size of 1-5/8" (42 mm) and allows up to 8 lines of your customized text. The Trodat Printy 4642 is perfect for most notary, corporate, or engineer seals. Create a custom notary stamp using your templates and our custom design wizard. The 4642 is a climate neutral product, and features a closing cap to help keep your stamp clean when it's not in use. Compatible replacement pads 6/4642 are available in black, blue, red, green or violet. Replacement pads are supplied in multiple packs of three. Customer evaluation "Indiana Notary Self-Inking Stamp - 1-5/8 Diam. Round"